Next to all the tall two-story houses on Clements Street the Smith House is comparatively tiny, and sits crooked to all of its neighbors. Note also its small windows and stuccoed stone chimney. Behind that unsuspecting vinyl siding is a wall hewn of stout logs that were cut down with an axe when Detroit was still a tiny village five miles to the south of here. According to the tiny State of Michigan historical plaque over the porch, this house was built between 1820 and 1850—which makes it one of the oldest standing structures left in the city—if not the oldest. 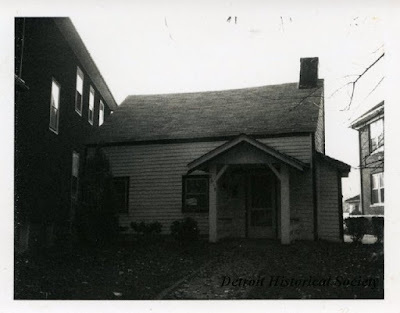 The current title of Detroit's oldest remaining structure rests with the Charles C. Trowbridge House at 1380 East Jefferson, which was built in 1826. The Smith House clearly does not align with those modern leylines, and instead remains oriented to a much older meridian, rebelliously bucking the uniform ranks of its surrounding 1920s brethren. Unfortunately Sanborn maps don't go back far enough to show when the house was built—they were first started in 1867. 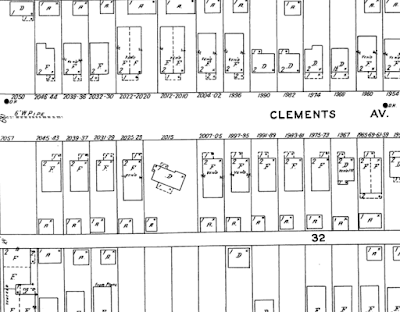 I imagine that the old Wayne County plat maps show when the James Smith farm appeared on tax rolls, which might be a good way to figure out the house's approximate age, aside from guesses based on the type of materials it's made out of. Another route might be to check through the city directories at the Burton Historical Library, which go back to the 1840s. 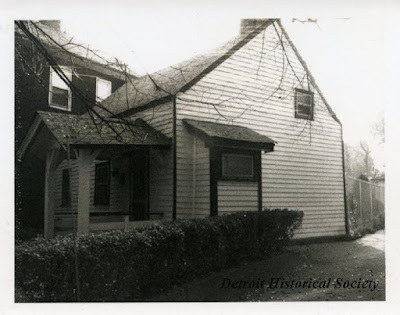 When James Smith built this house it was a farm on the edge of the wilderness, but who knows how many modifications and modernizations were done to it over the decades since then. 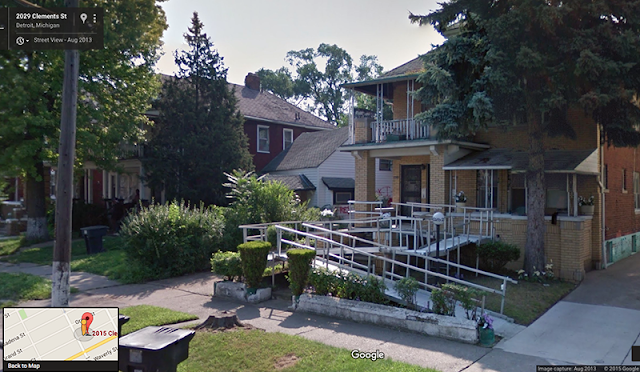 When this neighborhood was developed, the house was already 100 years old. The fact that it is still standing here intact at all and wasn't torn down to build a bigger house (or torched on Devil's Night) is a minor miracle. This probably implies that when the surrounding houses were built up, the Smith House was still occupied by an owner who had no intention of leaving—perhaps a living descendent of the Smith family itself. 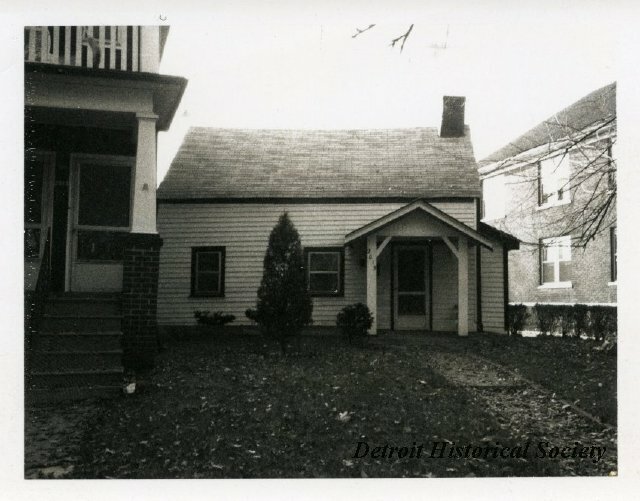 The house was listed in the Michigan Registry of Historic Sites in July, 1990. I became even more excited when I realized that the house was vacant and possibly for sale in 2013, but alas my dreams of log cabin ownership did not come to fruition. 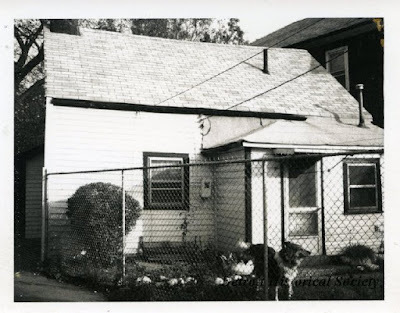 The Smith House is located in what would be considered by most historic home buyers as an "undesirable neighborhood," which probably explains why it sits empty and in a state of neglect. Not to mention there are few people willing to live in a place this small. But I bet there's already someone out there who's plotting to uproot it and move it to Midtown where it can become a frontier-themed artisanal coffee bar that no one can afford. 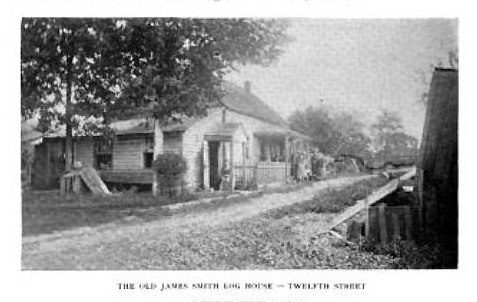 The caption says, "THE OLD JAMES SMITH LOG HOUSE—TWELFTH STREET," and the viewpoint of the photo appears to be looking west. More importantly it seems to show a lean-to addition to the house that no longer exists, and another perhaps farm-related structure on the right edge of the frame. The dirt path running through the center of the photo follows the general line of what would later become Clements Street. A c.1904 map I have of Detroit shows this area to still be totally undeveloped...12th Street (Rosa Parks Blvd.) passes nearby, but it becomes nothing more than a lonely country road once it goes north of Joy Road. "Loitering In A Known Drug Area"
Inside the Detroit Salt Mine!